The other day my hubs and I celebrated our 9 year 'together' anniversary. It's crazy to me that 9 years have gone by so quickly, so much has happened, and of course I love him to bits and pieces :) I created this anniversary mini album of my "Top 9 Favorite Memories"... really it's my favorite moments from each of the 9 years we've been together. Here we go! 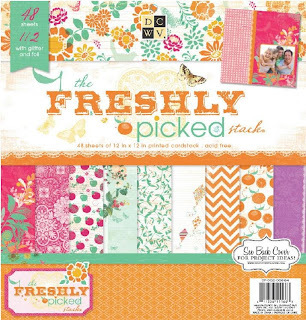 The album measures 2.5" x 4" and is made with papers from DCWV "Freshly Picked" stack. I cut cereal boxes to size and covered them each with the pretty papers using gel medium. really we like to think we're "kindergarten sweethearts" but who's counting? I forgot to add 'Honeymoon' to this list also! It was a busy year! Our 1st year in Connecticut followed by the most difficult year of my life. "I think we dream so we don't have to be apart. If we're in each other's dreams we can be together all the time." Thanks for taking this little mini journey with me! This is really CUTE! I like the stack you used. Happy Anniversary! What a sweet and loving anniversary gift, Rachel! Congratulations to you and the hubs and many, many more!! This is such a fab idea Rachel. You are inspiring me to make one of my own!! Aw this is a perfect anni gift!